Location: /Strings/Banjo strings/Ukulele-Banjo/PURE GUT UKULELE-BANJO STRINGS. THE ULTIMATE STRINGS FOR THE PROFESSIONAL. 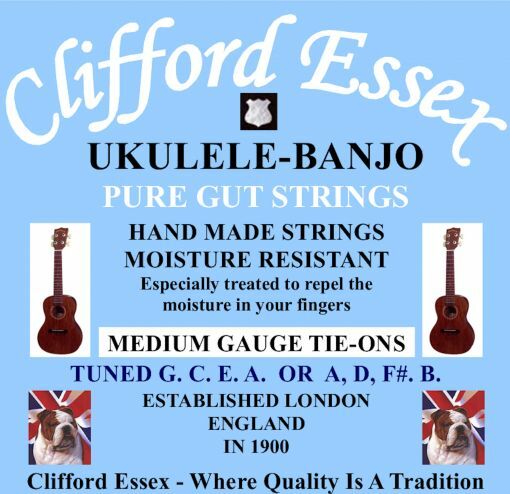 Many musicians much preferred the unique tone given by gut strings, players like George Formby used gut strings. The problem was that moisture from the fingers had a very adverse effect on the gut and they began to shred very quickly, small wonder that with the invention of nylon, gut strings went very much into the background, while players preferred the tone generated by gut, nylon was the next best thing and the strings lasted much longer. That has changed, these strings have been especially treated to repel any moisture, thus giving them a much longer life. The strings are all pure gut and generate a truly wonderful tone. Before fitting your strings please ensure the nut and bridge are free from sharp edges. The nut grooves should not be too deep and they should be perfectly smooth. Many years of research have gone into the production ot the strings (they take 8 weeks to make from start to finish) and we firmly believe they are among the best ukulele strings in the world. The manufacturing processes depends on a fine balance of automated production and skilled craftsmanship, guaranteeing that every string leaving the factory has been given the best individual care and attention that a gut string needs to make it a market leader. The sound produced by our genuine pure gut strings is very clear and full bodied, excellent sustain and a warm response. Just fitted a set of gut strings. Noticed a difference right away. Really nice tone will certainly reorder. Feedback ID - 72 - Trevor Connors. NATURAL PURE GENUINE GUT, UKULELE-BANJO STRINGS.